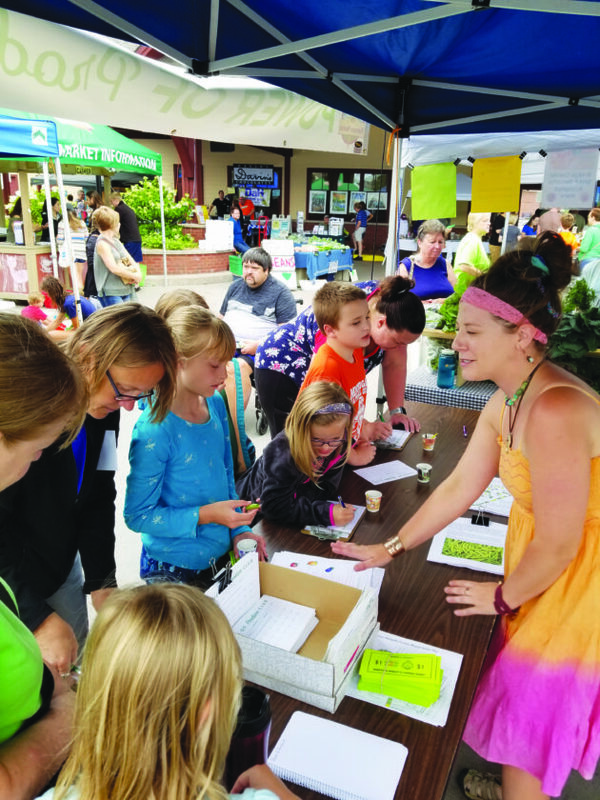 MARQUETTE — More than 200 children have signed up and are participating in the Downtown Marquette Farmers Market Power of Produce program. The Power of Produce program is in its fifth week and continues until Sept. 22. Children ages 4 to 12 are invited to participate. “We are delighted that over 215 children have signed up and are participating in the program,” Market Manager Myra Zyburt said in an email. Power of Produce is sponsored by Upper Peninsula Health Plan, Orthodontic Specialists of Marquette, Lions Club of Ishpeming, Lions Club of Negaunee, ACHIEVE of Marquette County and volunteers from Partridge Creek Farm. There will be over 60 vendors at the market on Saturday, including End of the Road Winery from Germfask, which will have its popular fruit and cold climate red and white grape wines available. Other notable local vendors include Pea Pickle Farm, U.P. North Roast and Superior Culture. Zyburt said the the market would like to wish the Marquette Marathon runners well as they race on Saturday. Zyburt said live music is scheduled through Oct. 27 at the market. On Sept. 8, there will be a tomato tasting offered at the market and Vicki Ballas of Michigan State University Extension will educate people on nutrition and food preservation. Alex Palzewicz, U.P. local food coordinator for Taste the Local Difference, will be providing a cooking demonstration on Sept. 15 featuring seasonal vegetables. She will also have information on the MQT Local Food Fest, which is scheduled for Sept. 29 at Barrel and Beam in Marquette Township. For more information about the event, visit https://www.facebook.com/events/219806432016007/. The outdoor season food tasting wraps up with a winter squash tasting on Oct. 20, which will be coordinated by Sarah Monte from the Marquette Food Co-op. The Downtown Marquette Farmers Market is sponsored by the Marquette Downtown Development Authority and is held from 9 a.m. to 1 p.m. every Saturday through Dec. 15 at the Marquette Commons, located at 112 S. Third St. The goal of the farmers market is to support local farmers, growers, and artisans by making wholesome, quality food and goods available to the community. The market accepts cash, credit/debit cards, SNAP, Double Up Food Bucks and Hoophouses for Health throughout December. WIC Market FRESH and Senior Project FRESH will be accepted until the end of October. Check the market website at https://mqtfarmersmarket.com for up-to-date information about who will be at the market. The market website also includes weekly recipes including foods that are available at the market. There is also a search function that allows anyone to look at the archived recipes.